﻿ how to: ingredients for making reindeer food. 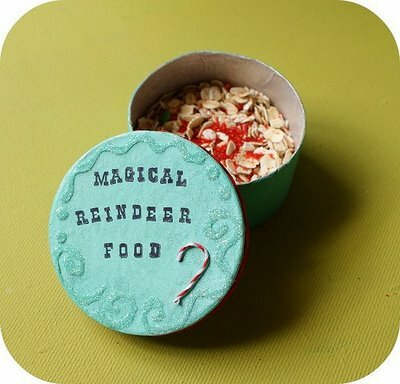 how to: ingredients for making reindeer food. One of the most important Christmas traditions at our house for is making reindeer food. We leave cookies and milk every year for Santa, so why would we forget the reindeer? We make up a batch for the reindeer that will come to our house, then mix up a bit extra to give to the kids’ friends. You can vary the recipe however you want but don’t forget the glitter, that’s the most important part. If you don’t add that how will Rudolph ever find the food in the snow? Santa’s reindeer will come around. one you must try to keep. when you are fast asleep. and hurry off to bed! << track santa with norad. We made some of this earlier this week and my daughter cannot wait to sprinkle it on our lawn (no snow here though). I’m sure the reindeer will like this much better than the carrots we usually leave them! I have done this for about three years now and every year my son is so excited to sprinkle the dust outside for the reindeer. Instead of sugar we use edible glitter (safe for the animals) it looks great on the snow and shimmers in the moonlight. What a great little idea! I am going to do this now, thanks! Thanks so much for sharing this one, I’d love to make little giveaway bags of this stuff for all the children in my son’s class next year. Sadie is almost 2 so we are now frantically figuring out how to make traditions she’ll remember. Feeding the reindeer is important! They must be exhausted and hungry by the time they get to the U.S.!